In the summer of 2014, with a generous $3000 grant from the Carrot Cache, our farm purchased a cold house for growing early and late season crops. Our main goals were to extend our growing season by many weeks therefore offering freshly harvested organic greens to our community – something that is severely lacking in our region, while simultaneously helping stabilize our farm income. We got the family together from as far as Denmark to build our structure over the course of the summer and it has so far fulfilled the goals we set out to accomplish and then some. First, we are on target for the income we projected. Second, we successfully grew our first harvest of cold crops in the fall of 2014 and marketed our products through our local food co-op and attended our Farmers’ Christmas Market in December. The demand for fresh greens at that time of year was insatiable as we had expected. Third, we will be incorporating the cold house during the summer to grow our tomatoes and other heat loving plants, and need to grow these crops under a protective cover from now on. Fourth, this structure proved it was the right structural choice for us. 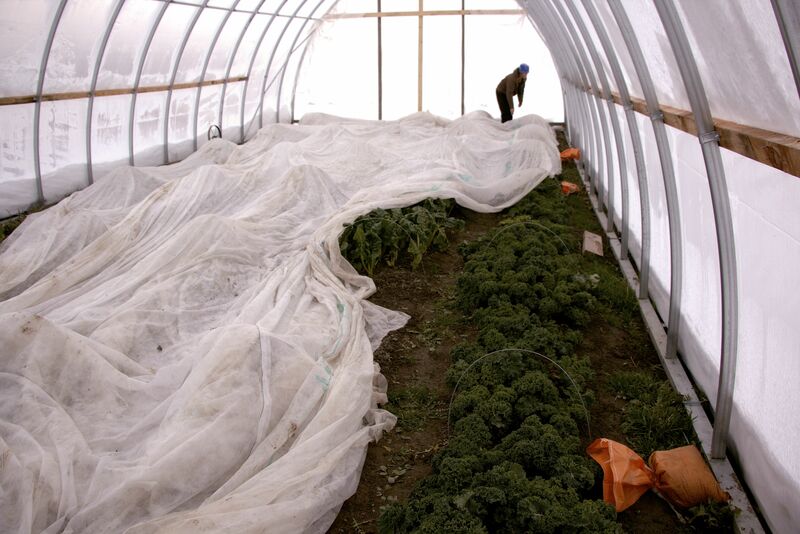 Devastating fall windstorms did not affect our cold house, while other local high tunnels (caterpillar tunnels and other similar structures) were destroyed and subsequently the crops beneath. The many possibilities, that this relatively small cold house offers, are becoming much more apparent. Despite the snow falling in March we have already seen plenty of regrowth from our fall plantings and the 30 degree C daytime temperatures inside have our soil warm and moist and ready for planting in the next week or so. Outside? Our main garden is still covered with several feet of snow. Aside from early planting we are developing the idea to try an early season CSA taking further advantage of our cold house crops as well as microgreens, shoots, asparagus and rhubarb. We are excited to use this structure to its full capacity for 2015 and would like to thank the Carrot Cache once again for giving us this opportunity to grow our business for our family and our surrounding community.